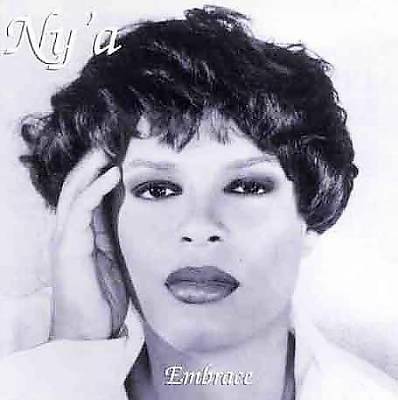 Ny’a is not a new comer to the music scene her debut album “Embrace” released in 1995 on Nap Records sold 500,000 units world wide giving her gold status. Eclectic is the best word to use in describing Nap Records recording artist Ny’a. Inspired by legendary R&B recording artist such as Marvin Gaye, Sam Cooke, Teena Marie, and Patti Labelle, Ny’a continues that rich, time-honored tradition of good quality music. From the much-anticipated Embrace debut album, to having two number one records on the R&B and the club charts, Ny’a has created and inspired fans all over the world. With the “Alright” and “I don’t want you” singles being smash hits internationally and licensed in 32 European countries, Ny’a has built a well-rounded career. Her Embrace album was an international success and licensed in 10 countries. The music was only one part of the success for Ny’a. She also had the “I don’t want you” video in rotation nationally on BET and the “Alright” video was in rotation in 40 markets nationally and hit as high as number 3 on the top-20 video charts internationally on Star-U.S.A. Network, in Abidjan, Africa charted by the Legendary Joe Webb. The “Alright” remix single, featuring rapper Chubb Rock, was in rotation on over 100 radio stations nationally and was on the Rock Da Houze movie soundtrack. The movie was written, directed and produced by Lathan Hodge, former Executive producer of BETs Teen Summit. The summer of 1998 gave Ny’a another big single. “The Take it to the top” single was produced by Grammy Award Winning Producer, Ken Johnston, with mixes from DJ Tony V. and DJ Spin. The background vocals were provided by club legends, Grammy Award Winning Singer Sabrina Johnston, Kenny Bohbein of Kenny and Friends, along with Sounds of Blackness background singer, Latrice Varrett. The “Take it to the top” single was the most request club record in New York City according to Sure Record Pool. It was number 13 on the club charts and number 3 on the radio-mix show 105.9 FM in Los Angeles, Ca. Ny’a opened for Motown recording artist Horace Brown on the Coors Light Tour and also opened for Arista recording artist Deborah Cox live on BET. Ny’a has also co-hosted the Kerry Hines radio show with the legendary Ray Goodman and Brown. She has successfully completed over 50 live appearances, over 40 national radio interviews. The national and international press has allowed for over 30 magazine interviews, over 15 television appearances and features in over 50 national newspaper articles, along with being featured on the cover of Boombox Magazine. She hit the streets hard again in 2004 with smooth R&B single “Your time is up” produced by Anthony Shipman. “Your time is up” was featured on the No Boundaries Soundtrack. Ny’a is back in 2011 ready to make some more history and add to her impressive list of accomplishments. Her hot new single “I need you” is sure to be a lady’s anthem! “I need you” is a smooth and timeless groove for all generations to move to. This is the new era of Ny’a. Enjoy the journey! !